In the 21st century it is primarily a dormitory village for Thame, High Wycombe, Aylesbury and London, and in former times supported a number of furniture-making artisans. The Icknield Way is a pre-Roman road. The site of an Iron Age settlement from perhaps the 4th century BC has been excavated on the Chiltern ridge in the southern part of the parish. Traces of Romano-British occupation have been found both on the same high ground and below on Icknield Way. There are records of Chinnor existing in the reign of King Edward the Confessor, when the manor was held by a Saxon royal servant called Lewin. The Domesday Book of 1086 records Lewin as still holding Chinnor, but soon after it was in the hands of a member of the Norman de Vernon family. However, in 1194 Walter de Vernon refused to help Prince John in France and all his lands were confiscated. In 1203 Chinnor and the neighbouring manor of Sydenham were granted to Saer de Quincy, who in 1207 was created 1st Earl of Winchester. However, in 1215 the Earl took part in the Baronial revolt against King John and his lands were confiscated. In 1216 all of the Earl's lands were supposed to have been restored to him, but Chinnor was granted to Walter de Vernon's grandson Hugh de la Mere in exchange for two palfrey horses and a term of service at Wallingford Castle. However, after the first Earl died in 1219 his son Roger de Quincy, 2nd Earl of Winchester successfully sued for possession of Chinnor and Sydenham. The 2nd Earl died in 1265 without a male heir. After the death of his widow Eleanor de Ferrers, the manor of Chinnor was divided between the Earl's three daughters Ellen, Lady Zouche, Elizabeth, Countess of Buchan and Margaret, Countess of Derby. By 1279 Elizabeth's third of the manor had been transferred to Margaret. This made the de Ferrers family feudal overlords of two thirds of Chinnor, which they retained until after 1517 when Walter Devereux, 9th Baron Ferrers of Chartley sold Chinnor to an Alderman of the City of London, Sir Stephen Jennings. Jennings immediately re-sold Chinnor to Richard Fermor of Easton Neston, Northamptonshire. In 1607 Fermor's grandson Sir George Fermor and great-grandson Sir Hatton Fermor sold Chinnor to Sir John Dormer, MP for Aylesbury. In 1667 Sir John's grandson Robert Dormer, also MP for Aylesbury, bought the Zouche manor that had been separate since the 13th century. In 1739 Robert's grandson Lt. Gen. James Dormer, a member of the Kit-Cat Club, sold Chinnor to a William Huggins. In 1761 Huggins left Chinnor to his daughter Jane and son-in-law Rev. James Musgrave, grandson of Sir Richard Musgrave, 2nd Baronet, of Hayton Castle. Chinnor remained in the family of the Musgrave Baronets until the death of Sir William Augustus Musgrave, 10th Baronet in 1875, when it passed to his brother-in-law Aubrey Wenman Wykeham, who took the name Wykeham-Musgrave By then very little of the original lands remained with the manor. His son Wenman Aubrey Wykeham-Musgrave inherited both Chinnor and Thame Park but in 1917 the estates were broken up and sold. By the early part of the 13th century there was a windmill on the Chiltern escarpment at Wainhill, about 1 mile (1.6 km) east of Chinnor village, Chinnor had a watermill, but by 1279 it had been transferred to the neighbouring manor of Henton. In 1336 the Ferrers manor at Chinnor had a windmill. In 1789 a post mill was built on the west side of the village off White's Field. It was dismantled in 1965 and has currently been rebuilt by the Chinnor Windmill Restoration Society. It is unusual in having 3 crosstrees and 6 quarterbars. At the end of the 16th century Sir George Fermor enclosed some of the woods in the parish Attempts to enclose Chinnor's common lands were ruled illegal and reversed in 1761 and 1817. Parliament passed an enclosure act for Chinnor in 1847 but the enclosure award to allocate the land was not implemented until 1854. On 18 June 1643 during the English Civil War a Royalist force of 1,800 men led by Prince Rupert arrived from Oxford, overcame the Parliamentarian garrisons at Postcombe and Chinnor and took 120 men prisoner. A pursuing Parliamentarian force intercepted them 7 miles (11 km) away near Chalgrove, but in the resulting Battle of Chalgrove Field the Royalists fought off their pursuers and returned with their prisoners to Oxford. 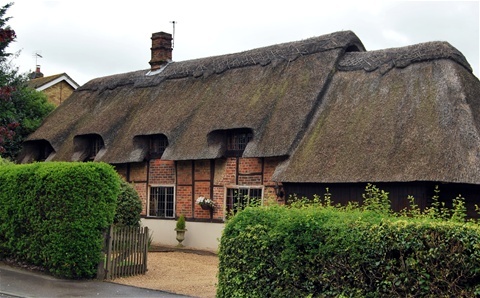 In the latter part of the 18th century a petition signed by the Rector and 13 tenant farmers complained that Chinnor had such a "multitude" of alehouses that they were "a check to industry and good order". The petition claimed that the Chequers was a house of illfame and called for its licence not to be renewed. The 1851 Census recorded 268 lace-makers in Chinnor, including labourers' wives and 86 children. Chinnor still has a lace making group. Chinnor Cement and Lime Co. was founded in 1908 and became a public company in 1936 It established a quarry in the Chiltern escarpment south of the village and a cement works. By 1975 it employed 160 men and was undergoing expansion to double its capacity. It closed in 1989, its works have been demolished and in 2010–11 the site was redeveloped as a housing estate Old Kiln Lakes. One of the Bee Hive Kilns has been retained for posterity. Chinnor grew most quickly in the 1960s - from a population of 1,961 in the 1951 Census to 4,471 in the 1971 Census. Chinnor was then largely concentrated around the main rectangular street plan of Station Road, Lower Road, High Street and Church Road. The hamlet of Oakley to the southwest was subsumed into the village around this time, when building along Oakley Road and the Mill Lane estate more than doubled the physical size of the village.